Synthetic peptide within Human M6PR (cation independent) aa 2450 to the C-terminus (C terminal). The exact sequence is proprietary. Our Abpromise guarantee covers the use of ab124767 in the following tested applications. WB 1/50000 - 1/200000. Detects a band of approximately 300 kDa (predicted molecular weight: 274 kDa).Can be blocked with M6PR (cation independent) peptide (ab169957). Heat up to 98°C, below boiling, and then let cool for 10-20 min. Lanes 1 - 4: Merged signal (red and green). Green - ab124767 observed at 274 kDa. Red - loading control, ab18058, observed at 130 kDa. ab124767 was shown to specifically react with M6PR (cation independent) in wild-type HAP1 cells as signal was lost in M6PR (cation independent) knockout cells. Wild-type and M6PR (cation independent) knockout samples were subjected to SDS-PAGE. Ab124767 and ab18058 (Mouse anti-Vinculin loading control) were incubated overnight at 4°C at 1/50000 dilution and 1/20000 dilution respectively. Blots were developed with Goat anti-Rabbit IgG H&L (IRDye® 800CW) preabsorbed ab216773 and Goat anti-Mouse IgG H&L (IRDye® 680RD) preabsorbed ab216776 secondary antibodies at 1/10000 dilution for 1 hour at room temperature before imaging. ab124767 staining M6PR in wild-type HAP1 cells (top panel) and IGF2R knockout HAP1 cells (bottom panel). The cells were fixed with 100% MeOH for 5 min. , permeabilized with 0.1% Triton X-100 for 5 minutes and then blocked with 1% BSA/10% normal goat serum/0.3M glycine in 0.1% PBS-Tween for 1h. The cells were then incubated with ab124767 at 1μg/ml and ab195889 (Mouse monoclonal [DM1A] to alpha Tubulin - Microtubule Marker (Alexa Fluor® 594)) at 1/250 dilution (shown in pseudocolour red) overnight at +4°C, followed by a further incubation at room temperature for 1h with a goat secondary antibody to rabbit IgG (Alexa Fluor® 488) (ab150081) at 2 μg/ml (shown in green). Nuclear DNA was labelled in blue with DAPI. Observed band size: 300 kDa why is the actual band size different from the predicted? Immunohistochemical staining of paraffin embedded rat colon tissue section labelling M6PR with purified ab124767 at dilution of 1/500. 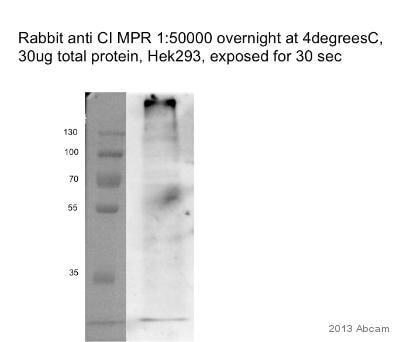 The secondary antibody used was ab97051 Goat Anti-Rabbit IgG H&L (HRP), at a dilution of 1/500. The sample was counter-stained with hematoxylin. Antigen retrieval was perfomed using Tris-EDTA buffer, pH 9.0. PBS was used instead of the primary antibody as the negative control and is shown in the inset. Immunohistochemical staining of paraffin embedded mouse colon tissue section labelling M6PR with purified ab124767 at dilution of 1/500. The secondary antibody used was ab97051 Goat Anti-Rabbit IgG H&L (HRP), at a dilution of 1/500. The sample was counter-stained with hematoxylin. Antigen retrieval was perfomed using Tris-EDTA buffer, pH 9.0. PBS was used instead of the primary antibody as the negative control and is shown in the inset. Immunohistochemical staining of paraffin embedded human thyroid carcinoma tissue section labelling M6PR with purified ab124767 at dilution of 1/500. The secondary antibody used was ab97051 Goat Anti-Rabbit IgG H&L (HRP), at a dilution of 1/500. The sample was counter-stained with hematoxylin. Antigen retrieval was perfomed using Tris-EDTA buffer, pH 9.0. PBS was used instead of the primary antibody as the negative control and is shown in the inset. Immunohistochemical analysis of formalin fixed, paraffin embedded Human papillary carcinoma tissue section labelling Mannose 6 Phosphate Receptor (Cation independent) with unpurified ab124767 at dilution of 1/250. Immunohistochemical analysis of formalin fixed, paraffin embedded Human tonsil tissue section labelling Mannose 6 Phosphate Receptor (Cation independent) with unpurified ab124767 at dilution of 1/250. Immunocytochemistry/Immunofluorescence analysis of Jurkat (human acute T cell leukemia) cells labelling M6PR with purified ab124767 at 1/100. Cells were fixed with 4% Paraformaldehyde and permeabilized with 0.1% Triton X-100. ab150077, Alexa Fluor® 488-conjugated goat anti-rabbit IgG (1/1000) was used as the secondary antibody. The cells were co-stained with ab7291, a mouse anti-tubulin antibody (1/1000) using ab150120, an Alexa Fluor® 594-conjugated goat anti-mouse IgG (1/1000) as the secondary. Nuclei couterstained with DAPI (blue). Immunocytochemistry/immunofluorescence analysis of 293T cells labelling Mannose 6 Phosphate Receptor (Cation independent) with unpurified ab124767 at dilution of 1/100. Flow Cytometry analysis of Jurkat (human acute T cell leukemia) cells labelling M6PR with purified ab124767 at 1/150 (red). Cells were fixed with 4% paraformaldehyde. Alexa Fluor® 488-conjugated goat anti-rabbit IgG (1/500) was used as the secondary antibody. Black - Isotype control, rabbit monoclonal IgG. Blue - Unlabelled control, cells without incubation with primary and secondary antibodies. Publishing research using ab124767? Please let us know so that we can cite the reference in this datasheet. We would recommend diluting this antibody for the tested applications. The storage buffer of this antibody contains PBS 49%,Sodium azide 0.01%,Glycerol 50%,BSA 0.05% so PBS can be used as diluent. Please advise your customer to check the recommended dilution range for the guaranteed applications.